Hello and welcome to Tuesday Tips! 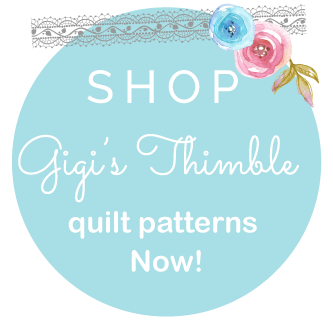 If you're new to this blog, Tuesday Tips is a new series where I invite well-known quilt designers and crafty bloggers to share some tips and ideas from their own creative spaces. 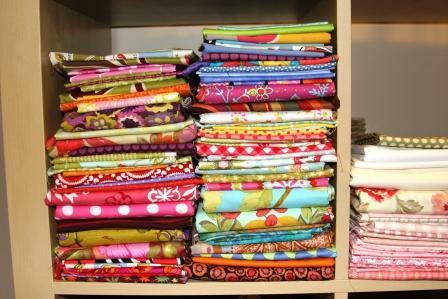 Tips that will help us be more organized and efficient in our sewing endeavours! And, if we can glean some ideas on how to make it all pretty, as well, then ~ BONUS! Today we have Mary from Mary's Cottage Quilts here to share with us. She's a local Utah quilt designer. I met Mary about 2 or 3 years ago when I first started designing quilt patterns. She came into the fabric store that I had just started working at. She was more than willing to answer questions for me about the business side of things. Mary is the sweetest and most down to earth gal! I consider her my mentor and a friend. Her patterns are fantastic and I'm really excited to see where she creates! Hello all of you out there in Blogland!! 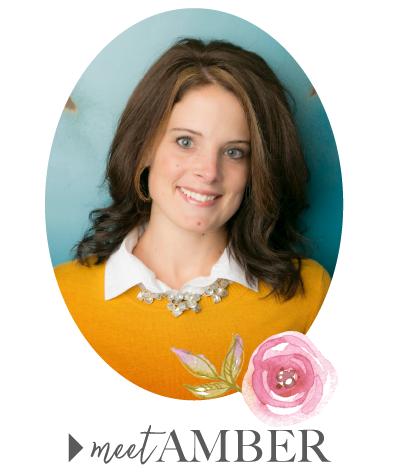 I am Mary Cowan of Mary’s Cottage Quilts and I am so excited to be a part of Tuesday Tips!! Amber asked me to do this quite awhile ago so I have had A LOT of time to think about what I wanted to say... I think, for me, the most important thing is to have organization! If things are cluttered and messy it makes me crazy (my husband would say “hmmm, that explains a lot”). I used to have all of my fabric in giant Rubbermaid totes in my closet. It was a nice way to have every color in its own little space. But the problem was that I couldn't really see what I had without hauling everything out of the closet. For instance, if I wanted the reds I had to drag the “red tote” out and dig through all the reds to find the perfect few. A couple of years ago all of that dragging around got very old and, using my best salesperson-ship (is that even a word??) I talked my husband into buying me some super awesome IKEA shelves. I think it’s actually called the Expedit bookcase. It comes in many different colors and configurations. The one that works best for my space is the 8 shelf design. 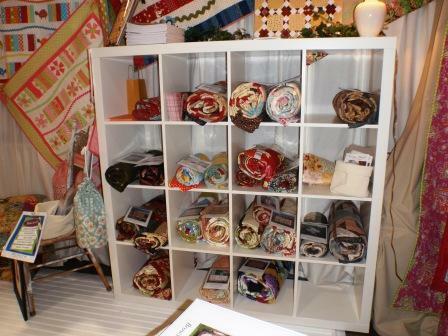 I also have the 4 shelf design that holds more fabric (imagine that) and some of my favorite quilting books. I totally LOVE having all of my fabrics neatly folded and out in plain view so I can see what I have. I am really trying to use my stash when designing/starting a new project and this is the perfect solution for me to be able to see what I have and then to add to it as necessary. It sure beats dragging out my totes every time I want to start a new project. I loved the Expedit bookcase so much I even used one in my booth at Spring Market in Salt Lake City. I also have a cool set up with my counter where I can sit and design/write patterns, surf the web, feed my addiction to pinterest or just keep up to date with all my facebook friends. I am very visual so I love to have things up on the walls that inspire me. I try to make my studio a fun, comfortable, organized place where creativity can flow freely. And if it’s a mess, I can simply close the door. So, there you go, thanks so much Amber for letting me yammer on and share my studio and a little tip or two with you all. 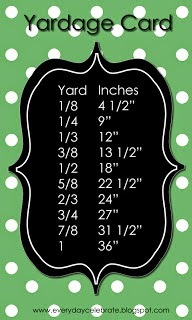 Stop by my blog http://www.maryscottagequilts.blogspot.com/and you can see what I am up to next. 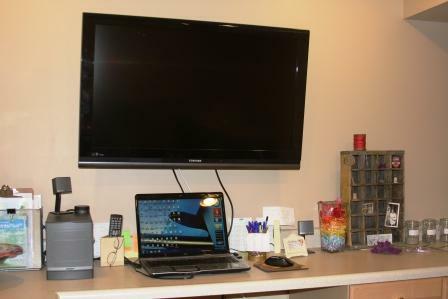 OK, Mary IS spoiled if she gets to have a TV in her sewing studio! :) What a dream! I think it's cute that she likes to watch football while she sews. Ha! My husband would be in heaven if that's what I chose to watch in my free time. Anyways, I love the idea of displaying what you love (especially in a sewing room). 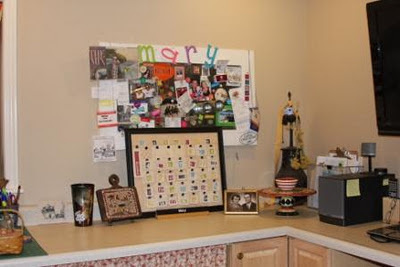 What a great space, Mary. Thank you for sharing it with us! Please leave Mary some comment love below. Thanks for stopping by today. I hope you're enjoying Tuesday Tips! Thank you to the both of you! A great blog and a great idea! Great room, it is inspiration to me to organize my sewing room. Thanks for sharing! 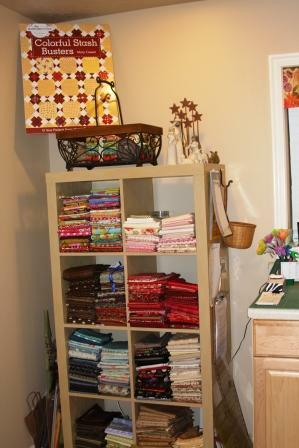 Thanks for sharing your organized sewing room with us Mary! Love the multi-purpose TV. I may have to put that on my list for Santa. Thanks for having a great guest Amber. I just love those Expedit bookcases, we have several throughout our house, their "look" changes from informal to elegant too depending on their color and how you display things too is cool. I love your shelves. I have something similar for all my fabric, sorted by colors. It makes it so much easier to find what you are lookin for. And I have a TV in my studio too, although I rarely turn it on, but its there if I want it. 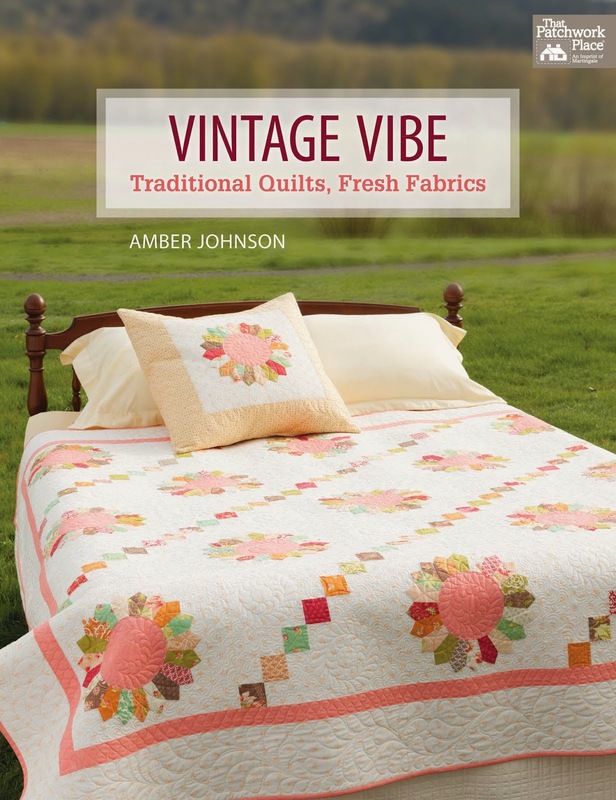 Happy Holidays to both you and Amber and may we all find 2012 filled with sewing moments! !